So, I want to share my stories with you so and give you some tips that will enable you to, under the Lord’s leading, complete more than you think is possible. 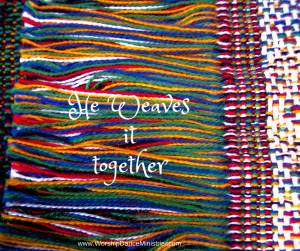 I also hope it will help you see how the Lord is constantly at work, weaving together the details of our lives into His larger tapestry. The Lord really gave me the dance we ended up sharing at our winter performance with very little extra effort on my part. The choreography process was unlike all my other choreography processes. I had several assignments for my Dancing for Him Level 3 school that involved choreographing two counts of eight of music. I had fun teaching these to my students. Then I simply strung them together, and it became this dance. I didn’t even initially choreograph it for this song. I choreographed the counts and they ended up fitting really nicely with this song. I look at the dance and marvel that He made it so easy, and I think the dance was beautiful and thoroughly worshipful. Girls with no previous dance experience and those with many years of experience loved dancing it. Their parents were deeply blessed, as was our community and the nursing home where we shared it. But for our spring offering, I had nothing for the first half of the semester. We played with one song, but I simply did not have a leading. Until Palm Sunday. On Palm Sunday, I ministered a solo dance to our congregation and a sister congregation. The choreography process was actually arduous for me, filled with uncertainty and struggle. I had to keep going back to the Lord and asking, “Am I supposed to do this? 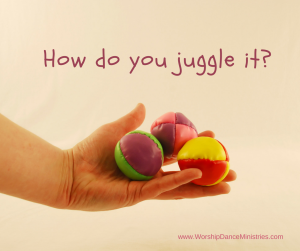 What do I do next?” But in the end, He gave me a dance that ministered. When I finished it, I knew that I had my dance for my modern dance students. I could see how this solo could be bigger, more moving, and more powerful with a group. So, we are working that our right now. I look forward to sharing it with you. Here is the solo. For the introduction: Use floor patterns of movement. Where the solo dancer may just dance down the aisles, see the group coming in from different corners and moving in a circle. For the body: Use cannon in movement. Where the solo dancer might walk for eight counts, have one dancer begin the sequence, and a couple more dancers enter every two counts. At key moments in the dance: Don’t underestimate the power of unison movement. When your movements are simple, having everyone do the same thing at once for a sequence is very powerful. Turning a solo dance into a group dance is a delightful challenge. Where the dancer may be able to execute more complex choreography herself, the group together, each doing simple movements, create a sequence that is even more visually interesting. A fantastic resource to give you more ideas is Lynn Hayden’s Creative Worship DVD. You will go away with so many ideas you’ll be looking for a dance to choreograph. 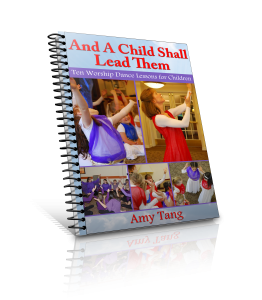 I have so much more to share on this topic, how I used the chorus of the dance I choreographed for one church in my kids praise dance class, how I’ve used so much that I learned from leading a prophetic veils study group in both my modern dance and kids praise dance classes, and how the Lord really does know how our assignments fit together. Can you share an example where the synergy between your assignments allowed you to participate in more than you would have thought possible? Do you re-use choreography? If so, how do you make sure you are still bringing something fresh from the Lord? It has been a long time I have not heard from you. I am dealing with many issues, but I know God is in control. I enjoyed your article and I really needed it at this time. The two dances were inspiring and the praise certain was given to God. Just keep me in your prayers and Blessings! Hi Nataya. It’s so good to hear from you. I have prayed for you today. Thank you for your encouragement. I love the dance, and how you used the movement assignments! I am just re-finding your blog after some time!! PS my blog that this leads to is about Challah (bread!) but I hope to add to it more with my dance experience, or see how the LORD leads if somehow they can come together. Thanks, Joanne. I am always encouraged by you. I enjoyed looking at your blog about Challah – so many beautiful images and rich with resources. Your artistry is so evident. Great article Amy! I often reuse choreography and sometimes will modify the movement with different levels are in opposite directions. I love to use cannons with groups. Sometimes I also use a few spontaneous solos within one song during the high peak with one person expressing with hands and then bring everyone back in unison to end the song. I will be using your advice here to finish up a piece I am working on right now. Thanks again for sharing! Yes, those are great ideas, Denise. I love the idea of spontaneous solos. I pray God’s blessing on the dance you are working on. I hope I get to see it.